Green Tea benefits information from Flora Force. Chinese green tea (Camellia sinensis) is a large shrub with white flowers, indigenous to Asia and China, where a delicately flavoured beverage made from its tender leaves has been drunk for the past 4 000 years. Modern research into the qualities of green tea reveal the presence of a polyphenol called epigallocatechin gallate, or EGCG, a powerful antioxidant that appears to inhibit the spread of cancer cells. 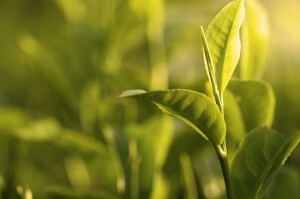 Green tea is made from the dried leaves of Camellia sinensis. Unlike other teas, green tea is unfermented. Apart from EGCG, green tea also contains fluoride, catechins, tannins and theophylline. The polyphenols reduce free radicals and can help prevent cancer and cell damage. Strengthens blood vessels and may protect against cardiovascular disease. May enhance mental activity and memory. Studies on animals suggest green tea helps reduce blood-sugar levels. Theophylline relaxes the muscles lining the throat and is useful as a treatment for asthma. Fluoride helps prevent tooth decay. Serve as a tea (allow the water to cool slightly before pouring over the leaves; this will accentuate the flavour). Green tea can also be used to add a delicate flavour to dishes. Boost your antioxidant intake with this recipe for fragrant noodle soup. In a saucepan, pour 700 ml of hot water over three green tea bags and allow to steep for five minutes. Remove the tea bags. Add 2 tablespoons soy sauce, 1 tablespoon pineapple juice and 1 tablespoon peeled and sliced ginger. Bring to the boil, then add 75 g rice noodles, 60 g thawed peas and 6 broccoli florets. Cook until the noodles are tender. Green tea is a safe supplement or beverage, but people who are sensitive to caffeine should not drink too much, and pregnant or breastfeeding women should not consume more than two cups a day. It can also interfere with blood-thinning medication and MAO inhibitors. Camellias are generally cultivated in tropical and subtropical regions, and should be planted in rich, well-composted soil in a damp and semi-shaded position. Water regularly in summer – the plant’s growing period. Keep moist during your area’s driest season.